…somewhere there’s music, How near how far? Born in Waukesha, Wisconsin in 1915 (his mother was related to both the makers of the Stutz automobile and the founders of the Valentin Blatz Brewing Company), Lester William Polsfuss began playing the harmonica at age eight. After learning to play the guitar (having failed at banjo) as an adolescent, he invented the neck-worn harmonica holder, which is still broadly used and manufactured to this day using his basic design. By the age of 13 he was playing semi-professionally at area roadhouses and before dropping out of high school to join a Western Swing band he had figured out a way to amplify his acoustic guitar by wiring a phonograph needle to a radio speaker. By the age of 19 Les Paul, as he now billed himself, had moved to Chicago and begun to play jazz and blues. In 1948 that “locomotive” was derailed for well over a year on icy Route 66 near Davenport, Oklahoma. His wife and singing partner Mary Ford was driving their Buick convertible when it skidded and rolled over and over, down into a creek bed. Lucky to be alive, Paul had shattered his right elbow and arm so severely that the doctors gave him the choice of amputation or having it all fused in one position. His choice was to have the arm set at an angle of just under 90 degrees, which would eventually allow him to pick and cradle his guitar. Of course, Les Paul is also remembered for his numerous inventions and innovations, such as overdubbing, delay effects and multi-track recording…and especially as the man who pioneered the solid-body electric guitar, making that Rock n Roll sound possible. Back in the 1930s Paul had become frustrated with acoustic-electric guitars, which hindered his improvisation. The main impediments were “feedback” as the acoustic body didn’t resonate very well with amplified sound and “sustain” as there was little dissipation from the instrument’s strings, which meant that not much sound generated through the guitar’s body. Experimenting in his Queens, NY apartment, his first attempt at a solid-body instrument was an actual 4” X 4” pine log, taken from a train rail, with an attached guitar neck, a simple hard-tail bridge and pickups. Immediately dubbed “The Log” Paul later installed sawn-off body parts from an Epiphone semi-accoustic guitar solely for the sake of a more convincing appearance. As was confirmed when it was recently displayed in the Smithsonian “The Log” was an ugly instrument, but despite it’s clunky appearance (Paul’s next prototype was called “the clunker” by the way) audiences were hugely impressed with its volume and the never-before-heard sounds that could be created with it. 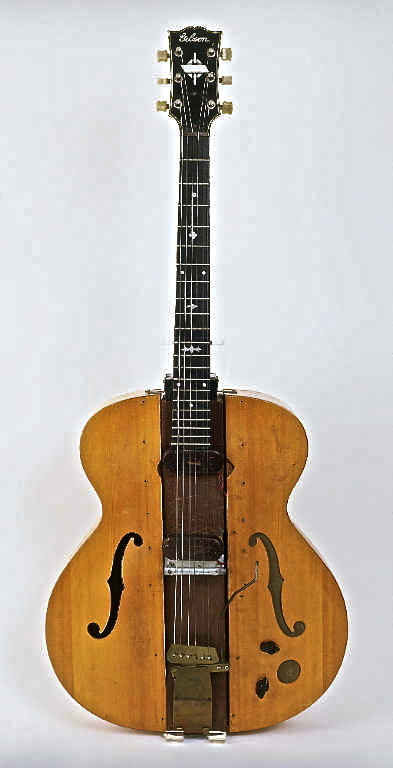 In 1946 Paul took his prototype to the Gibson Guitar Corporation and although the company didn’t use his exact design it was very happy to work with him and especially to use his well-known name to promote the first ever line of solid-body guitars in the 1950s. “Les Paul” guitars have long been a sought after brand ever since, especially for legions of popular musicians, many of them playing their own customized models. While “The Log” is now priceless, an original run-of-the mill ’52 Gibson Les Paul STD Gold Top can still be had for a mere $25,000. Recognized as an “architect” and “key inductee” to the Rock and Roll Hall of Fame, along with Sam Phillips and Alan Freed, among his many honors Les Paul is also one of a handful of artists with his own permanent, stand-alone exhibit. Written by Morgan Lewis and Nancy Hamilton and first featured in the 1940 Broadway revue, “Two for the Show” today’s selection has been a standard ever since. However, the most popular version of them all remains this one by Les and Mary Ford (the couple had 16 top-ten hits between 1950 and 1954) recorded on 4 January 1951. As an aside, I took the photo above of the Les Paul trio playing this song, one autumn evening in 1991, at Fat Tuesday’s in New York, where he reliably played every Monday for years.